Issues of mental health and insanity due to solitary confinement and other extreme forms of Sensory Deprivation, date back to the 19th century and were widely researched by a variety of academics and scholars at that time.Some of these early prison experiments indicated that many prisoners preferred the lash over solitary confinement, because it did not induce permanent damage and would not incite madness like solitary confinement. Mental instability has been linked to solitary confinement since the 1860s. Prison records of the Danish institute of 1870-1920 demonstrate, that inmates showed signs of mental illnesses in isolation, revealing that knowledge of this has been around for more than a hundred years before the British started serious experiment on Irish political internees, who later became known as "The Guineapigs" after an internee John McGuffuin, wrote a book about it by that title . The British as result of these Sensory Deprivation torture experiments, became the world's leading experts on the matter and refined it down to their sick art. 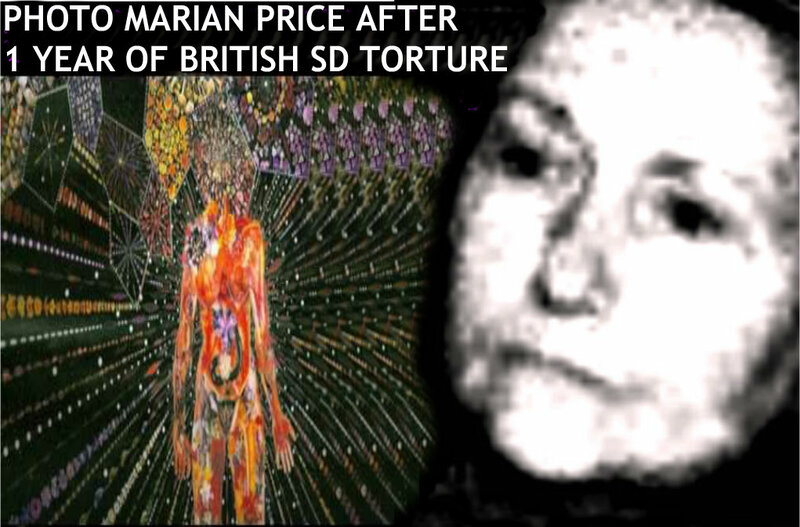 The British are very aware as result of these experiments, on how to induce various forms of specific psychosis and are still perfecting their dark arts, on their latest internees of political conscience, which includes Marian Price. The experiments are also used to induce a psychotic state, to later discredit political prisoners, such as the Price sisters when eventually they are released. The British experiments are often supplemented with different drugs, secretly administered in the food of Irish political prisoners. On other occasions the British use the induced psychotic state to induce the suicide of political dissidents. On June 5, 1975 Sean McKenna died. On his death certificate the cause of death was 'heart attack'. At the funeral oration Ruari O'Bradaigh, President of Sinn Fein said: "Before 1971 Sean McKenna was a strong, healthy man, but after suffering at the hands of the enemy, the great tortures to which he was subjected, his time was marked. He started to die for Ireland at 4 am. on August 9, 1971 when he was interned and tortured." At the time of his internment Sean McKenna, at 42 was the oldest of the Guineapigs. He was also one of those worst-affected. Following the experiment he was kept interned at Long Kesh, in a very bad state, for two years before being transferred to various psychiatric hospitals and finally released, only to die a year later. Professor Robert J. Daly of Cork University, who carried out a five year study of many of the Guineapigs, examined McKenna four months before his death reporting him physically fit. "He had a feeling of impending fatal illness and had gross symptoms of anxiety." Professor Daly also spoke of three of the other Guineapigs. "One 29 year old hooded man has developed Hodgkin's disease, of which there was no evidence prior to his arrest.Hodgkin's disease is a rare form of cancer. It is still not curable but can be treated. Another man has had surgical treatment for carcinoma of the skin which developed on one of his scars which he received on his leg while being 'interrogated in depth'. A fourth man has had colonic resection for suspected Chron's disease. He developed intense and chronic diarrhoea some three months after the 'interrogation in depth'. All the hooded men report disability to a greater or lesser extent and this has included outpatient and inpatient psychiatric treatment as well as treatment for medical illness." British Army training in 'psyops' or psychological operations, torture and sensory deprivation has continued with Marian Price, despite the British Government giving an 'assurance' that such methods would never be used again, when they were found guilty of torture in Ireland, at the International Court of Human rights in Strasbourg. The end result of the 'Guineapigs' experiment, like so many other experiment being conducted in British Occupied Ireland, is that the British are now regarded as experts at this form of torture and are regularly invited to give demonstrations and seminars, at places such as Fort Bragg, Carolina, and Fort Huachuca, Arizona and Bad Tolz in West Germany.They also instructed the fascist P.I.D.E. Portuguese secret police until they discovered to their disgust and embarrassment after an Army coup, they had unbeknownst to themselves, been giving lessons of Kitsonian counter-insurgency techniques and torture, to guerrillas in Latin American, who had infiltrated the Portugese Army and the British torture courses.